The new RC308 from Robomow is a great robotic mower that will suit many mid sized gardens in the UK. Offering a great range of features and the high end Robomow technology for a low price this is well worth looking at. This model is aimed to assist the busy family with keeping your lawn in great shape all year round so that you can enjoy it in those precious hours of free time that you get. If you have children and are working many hours the last job on the list is often cutting the lawn. When the sun is shining this means the garden needs tidying up and the lawn needs cutting before you can use it. 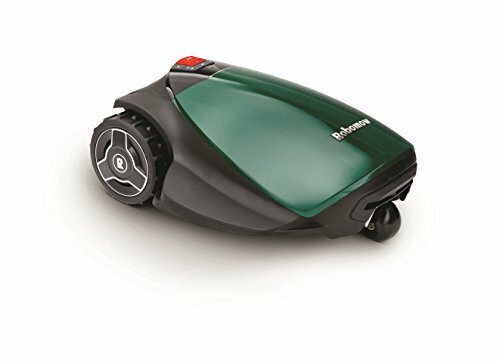 This is a thing of the past with the Robomow RC308, you can wake up every day to the perfect lawn and have more free time, amazing! This will cut lawns from the smaller new builds to mid sized UK lawns up to 800 square metres and will even cut fairly steep sloped lawns of up to 36% gradient at any scheduled time that is convenient for you family life. A really great addition to your garden. The benefits of owning the RC308 are endless but here are a few of the main ones. Cheaper than many robot mowers. Perfect lawn every day of the year. More time to enjoy the garden. Very quiet lawn mower, can cut while you sleep! Saves a lot of space. There are a couple of downsides but the pros massively out weigh the cons! Initial cost is more then conventional mower. Installation is easy on for the RC308, you will need to peg down a perimeter wire into your grass ensuring that is tight and on the ground so it cannot get cut. Once you have mapped out the lawn you put the mower on the charge station, schedule the cuts and off you go. It is so easy and will take you a couple of hours. Once it is done your days of spending hours cutting the lawn are gone. We think it is great value for money. No doubt it is a lot more expensive than a conventional mower but it will give you a perfect lawn all year round. The only other ways you can achieve this are to spend hours manually cutting the lawn or pay someone to do it for you. If your not a keen gardener and see mowing the lawn as a chore it is money very well spent. The safety technology that is fitted to the RC308 makes it a very safe mower to have in your garden even when it is mowing on its own. Setting a cut time for early in the morning or late at night means nobody will be in the garden while it is cutting. There are lift and tilt Sensor that stop the blades instantly if the mower is picked up or tilts onto its side and bump sensors stop the blades and send the mower in a different direction. A personalised PIN number and child lock mean the mower cannot be Started or rescheduled by anybody but the PIN holder. A very safe mower. There are so many great features and benefits to owning an RC308, have a read through below. You can alter the length of your grass by an easy blade height setting between 15mm and 60mm. Often during the summer you will have your lawn a little shorter than in the winter. The lawn edging capabilities of this model are great as it has a cutting width that is wider then the wheel width ensuring it gets right into the edges. The cutting width is 28cm which is wide enough to cut the lawn pretty quickly. The rain sensor will stop the cutting during rain or will not head out for a scheduled cut in the rain. Once the rain stops it will head out and carry on with the cut or reschedule if it can’t carry on. The Robomow RC308 will charge itself on the charge station before heading out to start cutting, if it runs out mid cut it will take itself back to the charge station to charge the lithium battery and then carry on with the cut. Cutting time on a full charge is around an hour and charging time is around an hour to an hour and a half. Cutting slopes of up to 36% is a really great feature, these steep awkward lawns are tough to cut with a conventional mower as it is hard work to push the mower up and down. Let the RC308 take care of it for you. The wide wheels have plenty of grip and the motor is more than powerful enough to go up and down these slopes. The robomow app is brilliant and makes this an easy tool to manage. You can reschedule it from your android or iphone and the mower will also send you updates if it is stuck or needs a part replaced. Good if you are not at home when the mower is working. If you have a lawn that is split into sections this is a great feature. You can map out the zones and program the mower to cut them whenever you like. Once it has finished a zone it will take itself to the next zone. You do need to make sure it can get to the next zone without any obstacles. You can map out up to six zones. The ‘Turbomow’ feature allows the RC308 to cut long grass that many robot mowers would not be able to deal with. It will get the lawn down to the required height before stopping the cut. If you have areas where the lawn will get long this is handy as other models need the grass to be short enough to get going. The Robomow RC308 is a great robotic mower that offers you cutting edge garden technology at an affordable price. The features mean this is a very versatile model that can cut steep and awkward lawns very quietly at times that suit your life. You can spend a lot more time enjoying your self and also have a lawn that is the envy of the street. It’s very safe for the children and easy to install. For all those people who don’t like cutting the lawn it is a must. Highly recommended! robotlawnmowers.org is a participant in the Amazon EU Associates Programme, an affiliate advertising programme designed to provide a means for sites to earn advertising fees by advertising and linking to Amazon.co.uk.